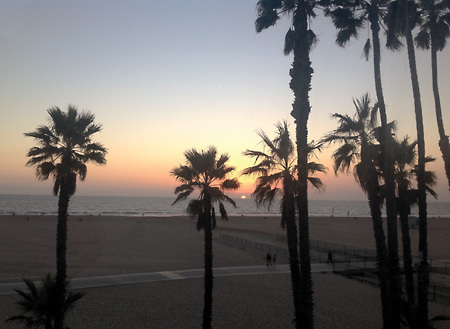 The craving for media content is insatiable the world over, so it’s good to enter ground zero for distributing your work – the American Film Market of Santa Monica, CA – with a clear head and well-defined goals. If you are serious about filmmaking, you know that the creation of a movie is more than simply development, production, and post-production. Proper distribution and marketing are also key components to the process. The learning curve is steep, so I recommend attending the world’s largest film market to get up to speed. I went to the American Film Market (AFM) in Santa Monica, CA, this past November and, as I have been to it every year, I think I have a unique perspective on that process. 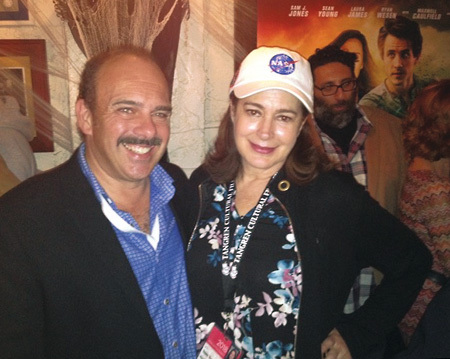 You can soak up all the aspects of filmmaking at AFM: distributors, talent, agents, crew, and so on. As content providers, we have a lot to benefit from by attending AFM. Unlike at a film festival, where few movies have been chosen to screen and you watch them as a consumer and possible buyer, AFM has viewings of an enormous amount of movies for sale only to buyers, who then place orders for the movies they need back home. For example, there may be dozens of buyers from Russia attending the conference who all need something different. One may need content for cable television, or a family or animated movie for their national channel. If you can understand how many different avenues there are to fill in the United States alone, you can understand this happens all over the world as well. Seeing what the various buyers are needing as well as reading the daily trades at the show – Variety, Screen, The Hollywood Reporter – will help you determine if you are making the right type of movie and who should be in it. I heard that more than 7,000 buyers from around the world went to AFM this year, all seeking content for their market or country. Different in 2018 was that not just anyone could walk into the market. A badge was required for entry whether you were a buyer, filmmaker, or distributor. Every room on every floor of the giant Loews Beach Hotel is taken up by office suites during the market. A lot of meetings also happened at nearby locales including Marriott’s Le Merigot hotel next door, the storied Hotel Casa del Mar down the street, Shutters on the Beach behind Loew’s, and various restaurants. A shuttle takes attendees to theaters nearby where the movies are shown. At nighttime, some of the film companies, distributors, and studios host parties to celebrate the industry. I strongly recommend getting a badge for the market. However, you can learn a lot about what motivates the market just by being on the street and around these hotels. Rental bicycles are now prevalent in every major city, yet, I wasn’t expecting hundreds of battery-powered scooters to fly down the streets! It was actually hard to walk on the sidewalks where renters parked them. Across town, I had lunch with the legendary Ed Asner. There is no shortage of celebrities at AFM, though! Within my first hour there, I had already met the lead supporting actor of the Denzel Washington movie OUT OF TIME, John Billingsley. Ron Howard attended to try and get financing for his latest film. The list of distributors present is like a who’s who of film content from around the world and the largest exhibitor is usually Lionsgate. This is in addition to the dozens of huge deals being made for multi-million-dollar projects over a lunch or dinner. For independent filmmakers, there are great opportunities for “Cinderella stories” – making a hit movie out of a compelling story. As you will read in the trade magazines, the big studios across Hollywood – 20th Century Fox, Universal Pictures, Warner Bros., etc. – tend to focus on stories with franchise capabilities. 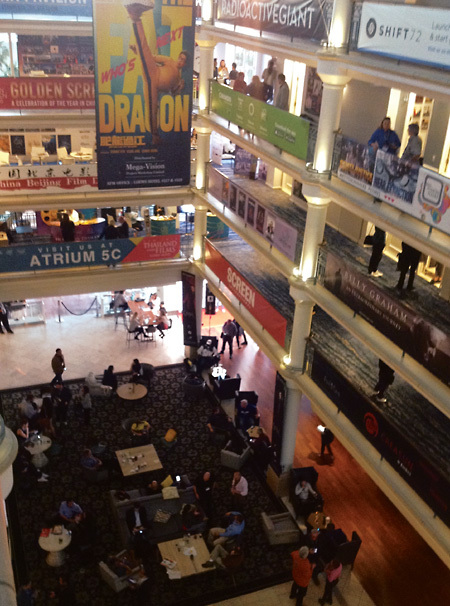 The film content at AFM is very diverse with many different genres and levels of talent evident. I saw a lot of new upstart distributors, which makes me think the successful U.S. economy has had a positive impact on filmmaking. It also seems the profit for indies is being made in genre films, following a cookie-cutter formula to match their hungry audience’s needs. While many films combine genres, indie genres tend to be very specific and, thus, easier to sell: horror, thriller, comedy, action, and so on. The underlying theme may be that a distributor will pick up your film if they believe you’ve captured the imagination of the hungry, overstimulated public while giving critics something to write about. Does that mean you need to have an Oscar contender or else don’t make the movie? On the contrary. It seems there is a place for every type so long as it’s well done with solid directing, story, and talent. What I mean by solid is that you can’t have one actor saying even one word wrong or a one-second effect in your film that doesn’t feel real. Audiences these days are very picky on quality, so do your homework and make it the best it can be. 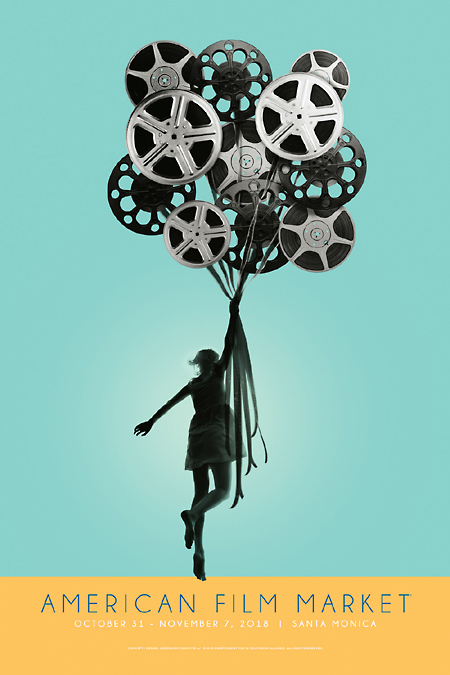 As dreamy as it sounds, the fact is independent filmmaking is a serious business. If you’re going to make a movie, don’t experiment. Follow the proven path of movies that came before yours. The tone of AFM 2018 seemed more positive than the previous year. However, it wasn’t without changes. Looking around the lobby, everyone is glancing at their phone. Whatever happened to mingling? Our cell phones have become mobile offices, which free up many of us to travel more. Unfortunately, they also allow people to ignore social interaction. I recommend having a plan of attack if you attend AFM. Weeks beforehand, look up the distributors’ list on their Web site and scour Internet Movie Database Pro (IMDb Pro) in order to try and set meetings related to your property. I’d start with an e-mail to the folks you want to meet and, as AFM gets closer, make a phone call so you can ask to meet with that distributor. Keep in mind they’re spending a lot of money for their suites in order to meet with buyers, not necessarily filmmakers. When I say to follow the proven path, I am talking about genre and the method of moviemaking. Where you absolutely need to be original is in the content. Give the distributor something to get excited about, something new they hadn’t thought of or seen anywhere else. Your advance research will show you what they’re making now. Just take that genre to the next level and you might have a foot in their door. It is difficult because that door is going to shut fast if you don’t have something unique. In Hollywood, they don’t want anything from you until they absolutely need something from you or after you’ve had a success. It’s a Catch-22 inevitability. The film industry is a very difficult industry to enter, period, so you need to wear a shield behind that AFM badge and be ready for rejection. Let it bounce off of you without taking anything personally. If you have what it takes, the outcome of selling your movie on a global basis is the reward well worth waiting for. It took me eight films before I was able to get into 42,000 Redbox locations. See you next time at AFM! The 2019 American Film Market will take place November 6-13. Article and photos © 2019 Robin Christian. Used with permission. This entry was posted on Thursday, February 7th, 2019 at 9:00 am	and is filed under Article du C-U, Business Matters, Gone Hollywood. You can follow any responses to this entry through the RSS 2.0 feed. Both comments and pings are currently closed. 14 distant relations of Jan Tschichold dissected this page in 0.376 seconds while exacting sweet revenge in silence.